"You're the only young man I know who ignores the fact that the future becomes the present, the present the past, and the past turns into everlasting regret if you don't plan for it." By 1973, Katharine Hepburn had conquered every major medium in the entertainment industry except one�television. She'd already won three of her four Oscars�, starred in countless film classics, triumphed on Broadway in dramas, comedies and even a musical, but never once acted on TV. Her rationale remains mysterious. Did she purposely shun the small screen, deeming it insignificant and unsophisticated, or did she worry her larger-than-life persona wouldn't translate well to the intimacy of home living rooms? Whatever the reason, television seemed a challenge the usually fearless Kate shrank from tackling. When producer David Susskind suggested she appear in a TV adaptation of Tennessee Williams' The Glass Menagerie as the flighty, neurotic Amanda Wingfield, Hepburn erected her usual barriers. But the insistent producer calmed her worries and granted all her creative demands, leaving Kate with no excuses. She signed on with considerable fanfare, and although her television debut didn't generate the blockbuster ratings ABC anticipated, her flawed performance remains a welcome addition to the Hepburn gallery. For those who never took a high school drama course, Williams' classic memory play examines how a domineering mother (Hepburn), tormented by her broken marriage and bleak financial prospects, unwittingly yet systematically destroys the lives of her two children. Son Tom Wingfield (Sam Waterston), an aspiring writer whose creativity is choked by his mother's ceaseless palavering, longs to escape the claustrophobic confines of his family's dingy St. Louis tenement. He and his mother bait and spar with each other, with Tom often fleeing their vociferous arguments, taking refuge at the movies or dousing his anger with alcohol. Daughter Laura (Joanna Miles), emotionally and physically crippled, reacts differently to her mother's nagging and meddling. She retreats inward, her painful shyness locking her in a dream world of fragile glass figurines and old jazz records. Clinging to the grace and gentility of her Southern upbringing, Amanda believes a gentleman caller will answer everyone's prayers, but namely her own�saving Laura from the shame of spinsterhood, providing the family with financial security, and allowing Tom to spread his wings. Tom reluctantly plays matchmaker, inviting a work buddy, Jim O'Connor (Michael Moriarty), home for dinner. What transpires that night irrevocably alters the Wingfield lives. Despite poetic dialogue and a haunting denouement, The Glass Menagerie hasn't aged as well as Williams' other, later dramas. It overflows with a youthful melancholy that appeals to dreamy-eyed teens, but can feel stylized and mawkish to more mature adults. Or maybe the play's just so familiar, its power and emotional pull has diminished over the years. In any event, Anthony Harvey's stagy, static direction hampers this production, lending it the feel of a 1950s Playhouse 90 episode. Lack of camera movement allows the actors to steal focus, but robs the film of any fluidity, which would have complimented Williams' lyrical prose. Hepburn brings her own affluent upbringing and lilting speech patterns to the role of Amanda, but can never be frumpy or pitiable enough to do the character complete justice. It's always tough to divorce a famous actress from her inimitable personality, so it's difficult to believe someone as resourceful and intelligent as Kate Hepburn would be as delusional and na�ve as Amanda Wingfield. Hepburn produces some lovely and affecting moments, but can't quite pull off Amanda's hopeless pathos. Waterston fares much better, believably channeling Tom's rage but never neglecting his tender love for Laura�a love that can't quite supersede his desperate craving for freedom and adventure, much to his "everlasting regret." Moriarty and Miles both won Emmy� awards for their performances, but Moriarty's natural, average-Joe portrayal of the pivotal gentleman caller is more effective. One of the treats of this DVD is witnessing the early work of both Waterston and Moriarty, which certainly foreshadows their future triumphs. 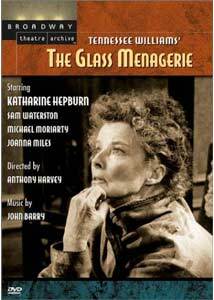 The Glass Menagerie will never be remembered as a high point in Hepburn's brilliant career, but her performance is nonetheless worth watching, as is almost anything the great Kate put on screen. Her initial foray into TV drama may not have been an unqualified triumph, but it brought a classic play to a wider audience than it had ever previously known. Image Transfer Review: Presented in its original full-frame format, Tennessee Williams' The Glass Menagerie benefits from a digital makeover, but the remastering doesn't erase the print's worn elements or, as a disclaimer states, the limitations of the source material. Plenty of white dots and dirt specks intrude, along with an occasional shake and shimmer, but the actors possess enough presence to overshadow these imperfections. A slightly faded look pervades the film, which unintentionally enhances the mood of memory and dreams, as well as the play's tenement setting. Shadow detail is weak as well, but none of these issues are severe enough to inhibit enjoyment of the play. Audio Transfer Review: The mono track is a bit uneven, with dialogue levels occasionally fluctuating and a tinny quality apparent throughout. Williams' poetic dialogue, however, is always clear and spoken by actors who know how to project and enunciate. Arguments and yelling bring about some distortion, but this no-frills track gets the job done. Extras Review: The image gallery is nothing more than badly reproduced newspaper photos from various Sunday TV supplements and a few clips from TV Guide. A group of production stills would have been preferable, but apparently none could be found. Almost an hour of previews for other titles in the Broadway Theatre Archive series (listed above) comprise the only other extras offered. Any DVD release starring Katharine Hepburn can be considered noteworthy, and Image Entertainment should be commended for resurrecting one of the actress's overlooked and under appreciated performances. This television adaptation is certainly not the definitive production of The Glass Menagerie, but it's a valiant effort made more appealing by the participation of Hepburn, Waterston and Moriarty. The real star, however, is and always will be Tennessee Williams, whose lyrical play deserves everyone's undivided attention at least once.